The Purpose Venn Diagram is a simplistic overview about where our current work situation is located. It provides us a starting point to reflect on if we might miss an aspect in our current (work) life and what that aspect could be. The Purpose Venn Diagram helps us to do create a more balanced work situation. Wherever we look we get well-intended career advice. To start with, we will have a closer look at what the usual recommendations for pursuing a business career are. Following our interests and the things we enjoy most sounds like a pleasurable path for a business career. Who would not love to call a hobby we might have “work”? For example I played several years basketball. I could not wait to go to the training. I was so excited about it that I even played in two teams at the same time. As probably every teenager in sports I fantasized about becoming a professional. It would have been a dream to do what I loved for a living. 2. Do what you are good at! As Dan Pink points out what drives us humans is mastery, which is defined as the possession or display of great skill or technique. In order to craft our skills it is probably the best idea to build on our already existent strengths. Gallup and its StrengthsFinder assessment are certainly advocating this view. Another career advice is to take a job that pays the bills. This rational and economical advice goes almost hand in hand with the advice to work as hard as possible now to enjoy life later on. Certainly there is pride and dignity derived from doing work as Miya Tokumitsu argues. We get a feeling of being needed and can support the ones we love. Especially in a capitalistic system we have to make sure that at the end of the month we can pay our bills. And even in the best possible work environment we could imagine, there will be tasks that simply need to be done. They might not bring us much glory, but they need to be done anyway. But what if we never get to the point where we could enjoy all the hard work because our living standard rises the longer we work? The job security past generations experienced, if it ever existed, is gone for today’s employees. Life takes place in the current moment and not in a distant future. Should we therefore not enjoy the journey more than reaching a goal that we now believe to enjoy in 30 years? We find the greatest meaning in tasks that are greater than ourselves. By serving others we become most fulfilled as Richard Layard points out. Just think about people who have devoted her lives completely towards the needs of other people or the world, like the Dalai Lama, Mother Teresa or Nelson Mandela. Even though they seem to bear unimaginable burdens and have suffered enormously, they are able to tolerate their own suffering because they find meaning in helping others to not experience the same. Do these career advices sound familiar? Even though the persons we receive advice from only want the best for us, we need to realize that they are speaking from their experience. They reflect on their lives and try to pass on what they believe was the reason for their success. Just imagine the dad who wants his son to take over his company, because he believes that it is the best solution for his son. Does the son see it in the same way? Everybody has its own unique perspective, which explains why so many people have different perspectives on what the ‘right’ way is. This leads to contrasting opinions, as we have seen with the career advices. So what advice should we follow? So far we have only looked at the different career advices individually. Every single one has well-sounding advantages and benefits. But what happens when we combine these advices? Will a new picture appear? In the following two overlapping advices are examined. We will especially look at which aspect influences the other one. Passion is the overlap of our interests and our strengths. The common assumption, which is also reflected in the above quote, is to follow what we love. This will lead to crafting our skills in the topic we are interested in and thus will lead to career fulfillment. This can be summarized as following our passion. The problem with our interests is, however, that they change. Today I don’t play basketball anymore. I became interested in other things. The same is true for others hobbies I once pursued. Would have a career based on interests sooner or later turned into a dead end? Benjamin Todd explains in his TED talk ‘To find work you love, don’t follow your passion’, that the likelihood of succeeding in a career based on passion is quite small. Although this fact should not be discouraging, searching for our one passion creates pressure. Terri Trespicio argues that searching for her passion has made her feel anxious. She worried about why she had not found her one interest, which made her not want to do anything. Cal Newport even argues that we have no pre-existing passion. Instead passion or interest is what results from applying our strengths. Most people develop their unique talent early in life in an encouraging environment. They then use it to create a successful career path and become so good, that no one can ignore them. Instead of following our interest, we should focus on our unique strengths. Jeffrey Katzenberg states a similar thought: “I believe every human being does something great. Follow that thing you’re actually really good at and that may become your passion.” By mastering our skills we will develop an interest because we realize the progress we make. Interest follows strengths or in different words, passion follows success. Profession is where our strengths meet the willingness of others to pay for it. Our whole business world is built on that idea. We get paid for what skills we can offer and at the same time we pay others for things we are not good at or do not want to do. I would also argue that most of the workforce is operating in a profession. We get trained for a certain position in apprenticeships or trainee programs or we get educated in universities and schools to learn general skills necessary for the business world. This all is done to simply exchange our skills for the most money. It is a basic equation. Higher skills equal higher potential payment. The problem is that it is completely rational. There are no interests or passions involved. Many professions are not designed for mastering the skills we once have learned, thus we cannot develop passion for the things we do on a daily basis. In addition, we are not working on what others need or are located in the organizational structure far away from the end consumer. In that way we have lost sight of who we are actually working for. This might be one explanation why around 85 % of the workforce in Western Europe is not engaged in the jobs they hold. Where we get paid for what the world needs is vocation. In a profession we trade time for money. In a vocation we get paid for the value we bring to others. Payment is measured in impact. However, the impact we can deliver will be relatively small if we are not able to apply our strengths and skills. Gordon Marino states that, “Our desires should not be the ultimate arbiters of vocation. Sometimes we should do what we hate, or what most needs doing, and do it as best we can.” His argument for doing what the world needs, even if that is not something we are good at or even interested is certainly relevant in some situations. But if we work on problems that are too ambitious and exceed our competency we get stressed, even though we might receive a lot of money for our work. We can do our best job and reach the most leverage, when we apply our strengths and use our full potential. We find ourselves on a mission when our interests meet world needs. This area might sound harmless at first, but it can easily lead to being exploited as Jonathan Malesic explains. As we are interested in a topic or task and see a real need in the world for it, we are often willing to do our work for free. We love doing what we do so much that we do not realize that we face exploitation by others because they pay us below average. The work we do should not only be measured in how much money we receive for it, but also for what impact it has on other people. Work should at least pay us fairly for the effort we bring. However, as we have seen in the vocation aspect, we can create the most impact if we apply our strengths. Slowly a clear picture is emerging. We have seen that our strengths are a good indicator for what career we should follow. At the same time, doing something that does not provide value for others eliminates us of the chance to receive feedback for it. This means we will not be able to develop a strong interest in it, unless we enjoy doing things just for ourselves. If we decide to not share our strengths with others no one will pay for our talents. It becomes clear that we cannot see one aspect without at least taking into account the others. In a calling our strengths, interests and world needs intersect. When we do good, by helping others through non-profit or charity work, we follow a higher calling that we believe in. Most often this work does not pay enough money to finance even a decent living standard though. The question is why is that so? Many jobs that are necessary and relevant are located in this sector. Examples range from doing development work in Africa as a volunteer, to raising children as a kindergarten teacher or taking care of the elderly as a nurse. Most of these jobs are paid below average if they are paid at all. The result is that we spent less time on tasks which involve our hearts and make us feel better, and instead pursue careers to simply earn more money. When we do something we are good at, which interests us and we get paid for it than we find ourselves in the career sector. The description sounds well rounded. Why should we ever question these good things we have? As can be seen in the diagram, it is very self-focused. It gives us everything we need, that is true, but it does not do any good for other people. And by now we now that we need meaning in our careers. We need to work on something that is greater than we are as individuals. In the corporate world it is often possible to pursue a career in a position or whole department that is not providing any value for others. The function simply has no purpose. We might have fancy titles, job descriptions or degrees, but what good does it do if we are not using our strengths for the well-being of others? A paradox of a career was introduced by Laurence J. Peter in the ‘Peter Principle’. His theory explains that in a hierarchical organization we get promoted, based on the outstanding work we do, until we reach our level of incompetence. When we have reached that position, we do not get promoted further since we show no competency for justifying a promotion. Ultimately, with enough time and positions to be filled, every position in an organization will be occupied by a person who is not qualified to do the job. Over the long term we get promoted out of jobs that are suiting our strengths and we end up in roles we have no skills for. That will leave us with a paycheck, but also with a state of arousal or anxiety. When we do what we are good at, get paid for it and solve needs of the world, we work for a cause. That sounds like a great work environment while doing good, which is why it could easily lead to a situation of comfort. In such a situation the amount of work is not too high while we receive our paycheck every month. If however the work load increases how do we deal with it, since we do not love what we do? Sure, we have learnt that passion follows success, but has our interest developed fast enough and are we loving what we do enough to sustain stressful times? Have we developed our skills so that we are able to deal with the increased amount of work? If the answer is no, than working for a cause with high work load can easily lead to stress or burnout. If we do not find our passion within the job, there is the opportunity to look for it outside of work. ‘Effective altruism’, which was coined by Peter Singer, can be summarized as using our skills to help the most people possible. An example could be to use our programming skills to work for a hedge fund, so that we can make the most money and thus can give back more. The question is if this interest, which is not coming from the job itself, can be strong enough to stand a work environment we do not completely identify with? When we possess what the world needs and is willing to pay for it and we are interested in it, then we possess potential. Most often this is expressed in an idea or innovation. The potential lies in that we could learn how to apply our skills to pursue this idea. Our motivation steams from the interest in it. If we are not able or motivated to learn the skills to for example advertise our idea, we could also find complementary skills in other persons. In that way we can still use the potential of our idea. We all have made unique experiences which form our convictions. We all see the world through our belief system. Therefore, it is necessary to take into account our own experiences as Edwin Korver points out correctly. We need to reflect on our own journey and think about are we satisfied with our current situation. 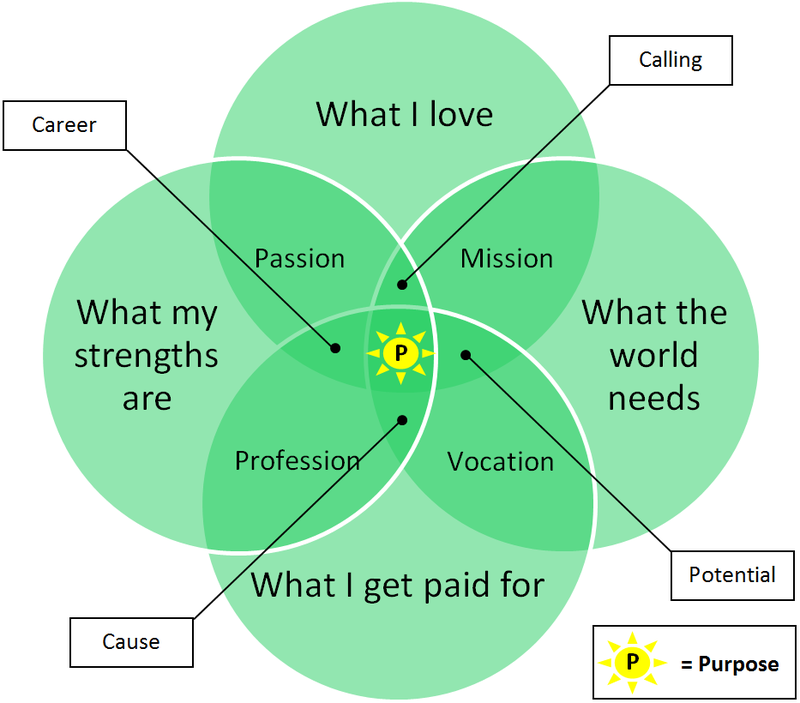 Are we satisfied with the sector of the Purpose Venn Diagram we find ourselves in? If not, how can we integrate the knowledge we are exposed to into our own lives? In order to know what is relevant for us, what advice we should consider and what path we should follow in the future, we need to know what it is that we want. Well, easier said than done. When I finished high school I did not know what I wanted. Even after finishing my first study program I was not sure if I was ready for taking on a job. The same was true after the second program. Even nowadays, there are days where I question if I am on the right track. So how can we ever be sure to do the right thing for us? To be honest, I think there is never a security no matter what we do. That is why I believe we need to adapt a lifelong learning mentality, where we approach everything we do with curiosity. That will take of the pressure of doing the right thing and it will eliminate failures, since we see everything as a learning opportunity. I believe that we need to make as many experiences as possible. This will give us a sense of what we do not want, but it will also provide us with positive experiences of which we want to implement more into our daily lives. The last part we have not taken a closer look at is the center of the Purpose Venn Diagram. In the purpose sector we are able to do work that we are good at and find interesting, as well as providing value for others while we get paid. This description sounds utopian facing the reality of the current business world. Besides the difficulty to achieve it, is it even desirable to have a purposeful work situation? As we have seen different examples from all the others sectors, we need to acknowledge that it is possible to have (meaningful) careers in many different ways. As we have also seen in the long run ignored problems might come up to the surface though. The advantage of working with purpose is that it creates a balance of what we love to do, using our strengths, thereby providing value to our environment while getting paid for it. Of course this is the ideal environment, which many people do not work in currently. But should we not always thrive for the optimum? Why should we settle for less? Why should we be satisfied with a job if we can have a fulfilling life? How to create a purposeful work environment? In order to get to the core of the Purpose Venn Diagram, we can reflect on where our work environment is located. Then we can see what aspect we need to integrate more into our daily lives. We need to build on all the good things we experienced. Then we will find our sweet spot. In order to make things less complicated we can focus on what we are good at and what the world needs. If we know what our strengths are, we will be able to develop an interest in the topics we deal with over time. If we are working on pressing problems and help other people than there will be someone paying for the value we can offer. It does not mean anything to follow our passion if it is not in the service of others. 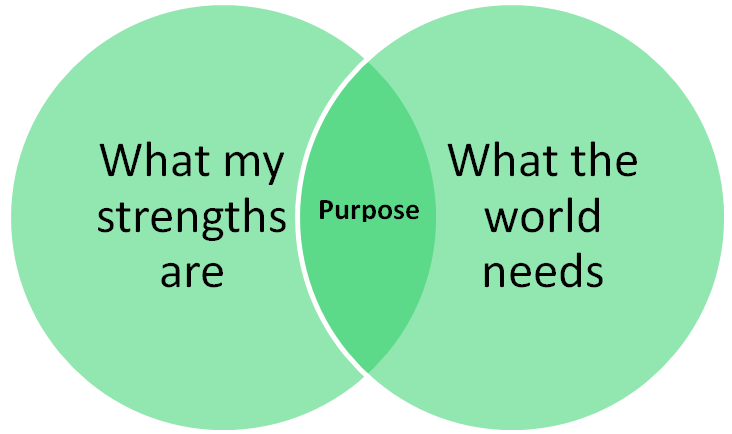 So ultimately it comes down to the horizontal axis of the Purpose Venn Diagram; What we are good at and what the world needs. Aristotle already knew it long ago. What aspect could you use more in your work environment?